In 2008, the Quebec government introduced a compulsory program — Ethics and Religious Culture — requiring schools including Catholic and private Christian/church schools in the province to teach all religions including paganism, Wicca and Christianity. According to the Canadian Charter of Rights and Freedom everyone has the freedom of religion and conscience and can’t be forced to compromise their religious convictions. Quebec had a similar provision in its provincial charter which the government modified to enforce its new program. Shortly after the program was introduced, Montreal-based Loyola High School challenged the legality of the new curriculum in the courts claiming it was an attack on religious freedom. Loyola is a Catholic school run by Jesuits. However, in the Quebec-based courts, Loyola lost and it appealed the lower court’s decision to the Supreme Court of Canada, which has agreed to hear the case. The Alliance Defending Freedom (ADF) along with other faith-based organizations were allowed to join Loyola in its Supreme Court challenge. The ADF is a non-profit organization consisting of 2,300 lawyers who have joined together to defend freedom. The Canada Supreme Court is expected to rule on the case by the end of the year. This is a serious case that could potentially affect Christian and faith-based church schools and home schoolers across Canada. The Apostle Paul exhorts us not only to pray for our political leaders, but “all who are in authority.” This includes Supreme Court Judges. Click here for a list of Canada’s current Supreme Court judges, please pray God will move on their hearts. Proverbs 21:1 tells us the King’s heart is in God’s hand and the Lord is willing to move on their hearts, if we will pray. 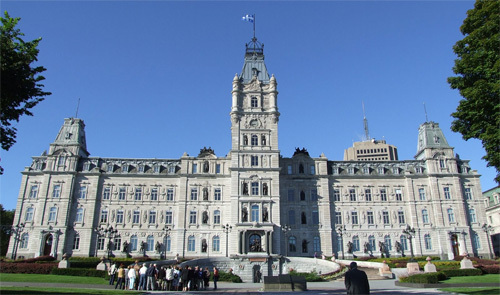 The Province of Quebec is embroiled in an election and people will go to the polls April 7, 2014 to choose a new government. The ruling party that brought in the legislation is the Party Québécois, arguably the most left-leaning provincial government in Canada. They are also a separatist party and has publicly stated if elected it will pursue Quebec separation from Canada through a provincial referendum. The party has held two referendums on separations in the past, both of which the people of Quebec rejected.